The fastest way to learn about something new is to ask questions. 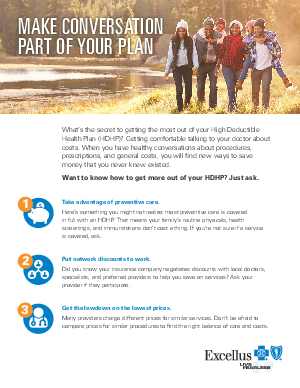 But when it comes to high deductible health plans (HDHPs), many employees aren’t sure where to start. So they’re left feeling uncertain about how they’ll afford health care services. If you want to help your team get the most out of their HDHPs, provide a framework for deeper conversations with doctors and pharmacists. Help them understand the basics and show them how to ask questions with confidence. With this handout, doing all that is easy. Looking for more ways to empower your employees to take charge of their health plans? Remember, Excellus BlueCross BlueShield is here to help. We’re always ready to answer your questions.